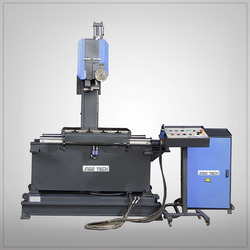 Our range of products include hydraulic vertical bandsaw machine. We hold expertise in offering Hydraulic Vertical Bandsaw Machine to the clients. Our offered machine is made from high-grade factor inputs to maintain the product quality in terms of durability and maximum strength. Clients can avail this entire range from us in different specifications. These machines are used in chemical, energy, oil gas and metallurgical industries. Hydraulically operated work table to feed the lob automatically at desired feed rote upto desired length to be cut easy base Hydraulic blade tensioning . Infinitely variable bond speed through AC frequency drive unit (optional).